Another auction buy that languished in the garage for months until I pulled it out and thought..."Hum, I kinda think that is cool!" It may not LOOK cool, but it is a funky little chair...and I like "different." Not really my style (Hollywood Regency maybe?) but since my style is "eclectic," I can find a place for it! After I stripped all the old fabric, I used my 1/2 and 1/2 mixture and stripping process to strip the old finish and stain...then I applied 4 coats of tung oil finish (no stain)! I like the warmth of natural wood. As always, if one comes in, one must go out. 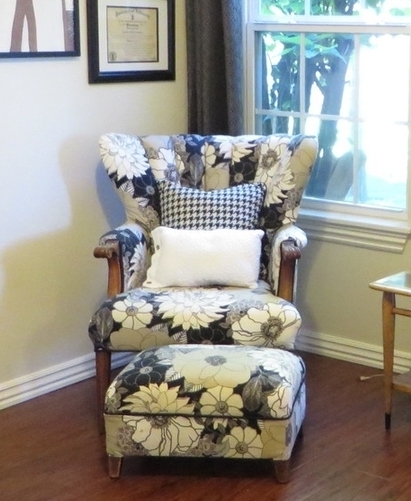 So this little chair in my office was moved upstairs into the guest room until I have room in my space at 410 Vintage! I bought it 25 years ago at an estate auction and it was my first real reupholstery project. And spice it I did. When I was looking at fabrics I found an awesome pink velvet. I was briefly tempted to cover the chair in the fabric but I knew it would be a "fad color" I would later regret. But I couldn't stop obsessing over the pink so I decided to find a pink accent pillow. Naturally, I couldn't find a pillow I like so I ended up buying a little bit of the pink velvet and made a little pillow. Instead of cording, I decided to go with tassels on the corners but couldn't find any I liked...so I made little "tufts" out of feather cording...just too stinking cute! A simple but fun little detail that brings in the pink I was drooling over without the huge commitment of covering an entire chair in it! I would advise taking this approach on all "big ticket items." Couches, chairs, bedding...keep them neutral and add the "fad" details and colors with pillows, throws, curtains and rugs...accents that are relatively inexpensive to change out when the color falls out of favor in a few short years! By the way, you may have noticed I changed the curtain...I went with white just to lighten the corner a bit! I could never post a good tutorial on how to upholstery YOUR piece of furniture...there are so many great video tutorials online for just about any style of chair/couch/ottoman/etc and I strongly suggest you do a lot of research before you start your project. Find a tutorial that best suits YOUR needs. I will share a few tips that will make your job a tad easier. It doesn't matter if you are recovering a chair or couch or ottoman...these rules apply! First, learn to sew. Every DIYer should know how to use a sewing machine if for no other reason than to sew pillows or curtains or do basic upholstery or even hem a pair of pants. If you don't know how to sew a straight stitch, learn! I was fortunate that my mother made me take sewing lessons when I was young but I know a lot of local county extensions and hobby stores offer cheap (if not FREE) lessons! Take them...learn! And don't think you need an expensive sewing machine...I have a basic cheap machine that is at least 30 years old! The drop cloth material I used was relatively inexpensive and super easy to sew. And I used a premade bias tape for the cording. Take your time! I always think a project will take a lot less time than it actually does...so know that reupholstering anything isn't a "rainy day project!" Maybe a rainy WEEK...but deconstructing alone will take time and a lot of patience and you want to do it right! Take LOTS of pictures while you deconstruct! Just snap random pictures as you strip the piece. If you are like me you THINK you will remember, but you won't...and you will find yourself sitting there wishing you knew how in the world it was originally put together. So take pictures! It is always good to have a visual reference! TRY to keep the pieces of the old upholstery intact so you can use them as a pattern for the new. If the old is really stinky and ewwwy, make a "pattern" with them out of butcher block paper or old newspaper. Make sure you label each pattern piece or old fabric so you know where it goes! And keep in mind that the fabric you remove has been trimmed...so add a few inches on each side of the piece...you can always trim after it is attached! 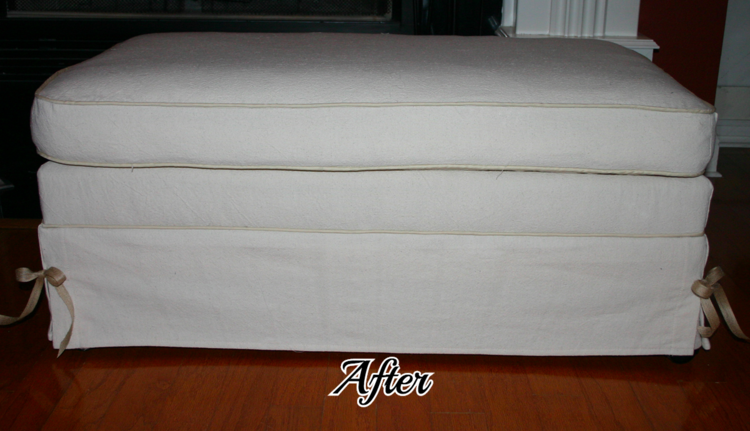 If you are going to strip and stain or paint, do it after you strip the old upholstery but before the new! Take time to make repairs! Make any repairs that need to be made BEFORE you start painting/stripping/staining and reupholstering! Do not spend the time and money reupholstering a chair if it wobbles or needs new strapping. If you don't know how to repair something property, Google it! Or email me! And remember, glue and clamps are your friend...not silicone, not sheetrock screws, not nails. Do it right or you are wasting your time!!! Remove ALL the old upholstery nails and staples...all of them. And honestly, I have bought every tool on the market to make the job easier and I always revert back to a plain ole' flat screw driver, a hammer and a pair of good needle nose pliers! Which reminds me...wear shoes! I don't care how careful you are, those nails and staples fly all over the place and you WILL find them with your bare feet! 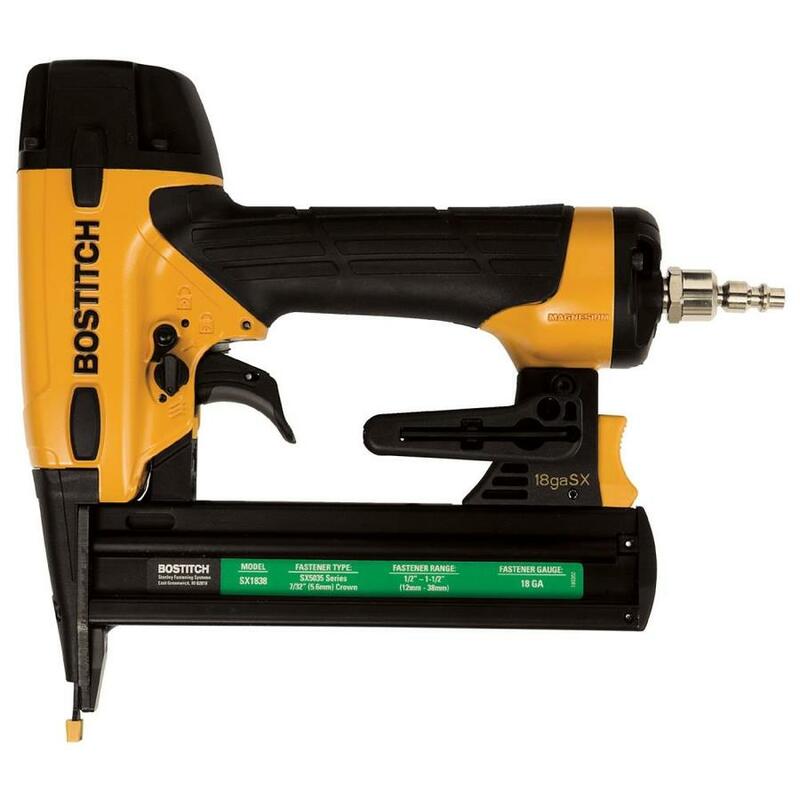 Speaking of tools, I think I have tried every electric and manual stapler on the market. I have found that MOST will not set a staple flush or securely. So now I use a pneumatic stapler, similar to this one. Best. Stapler. Ever!!!! But word of warning...don't make a mistake and don't plan on recovering the piece any time soon because those staples aren't coming out! Alway cover old batting with new. Even if the old batting seems to be in good condition, cover it with new batting. Always! If it has old horse hair stuffing replace it...if it has old "strapping," now is the time to replace it!!! On a few chairs, I have actually stripped everything down to the bare wooden bones and added new everything. Trust me, that is better than getting it all back together and discovering that the seat still sags or is lumpy and it smells! Buy enough material! When you buy material make sure you account for any piping (welt cording) you might have to make. You can buy premade cording, but if you are going to make it out of the upholstery fabric it MUST be cut on the bias...in other words, diagonal across the fabric. To give you an example, on this little chair, I needed less than two yards for the seat and back, but I needed another yard just so I would have enough to make the welting. Again, google welt cording/piping and you will find great tutorials that will show you exactly how to make it. Make sure you have enough fabric to complete the project before you start. Lay ALL your "pattern pieces" out on the fabric and account for the welting before you start cutting. Nothing is worse than getting half way through the project only to discover you don't have enough fabric...and you bought the last bit of it! If all else fails you can always use two different fabrics on the project like I did on these little tuffets...but PLAN for it! Google, google, google. I learned a lot at the elbow of my dad but today we have the world at our finger tips and you can find a good tutorial for just about any project...even upholstering furniture! I always advise watching as many tutorials as you can find and use the one that makes the most sense to you and your project! Watching DIY tutorials is also a great way to decide if you even want to tackle the project...advisable before you buy a wingback chair at a garage sale for $20 with the intent of "learning to upholstery!" When Matt decided to buy his first home (details here), I knew my love for "making old new again" would come in handy! I love the dresser and chest I found and refinished! He was able to use the farmhouse trestle table I featured here. And of course this "cute as a bug's ear" vintage chair makeover! 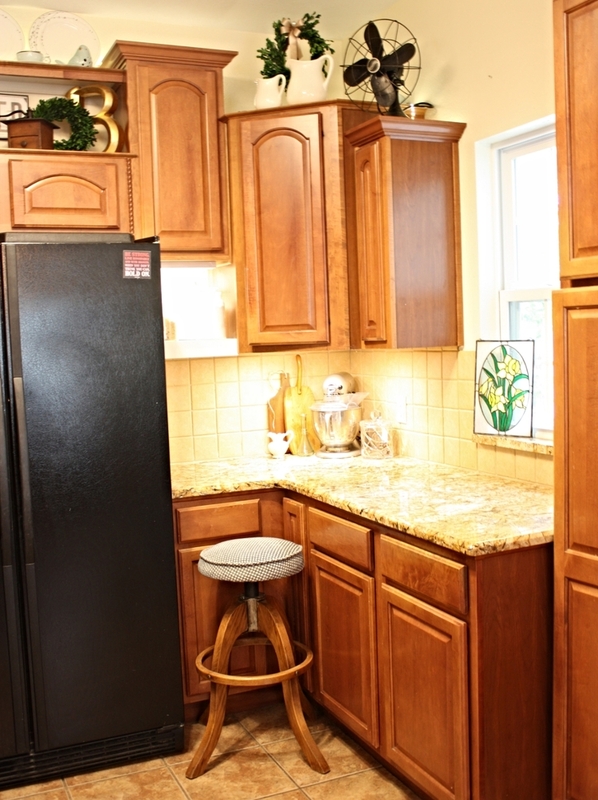 But he didn't have a table that would fit in his breakfast nook...a relatively small space in his kitchen. I knew it needed to be a round table since the space is only about 9x9. I found this round oak table at a flea market...a tad dated in it's original condition but I knew exactly what I wanted to do with it. Normally these oak tables are around 48" in diameter but this one was only 32" so it is the perfect size...just not the perfect finish. I honestly didn't want to strip and restain the top so I decided to go with gel stain...again, I ONLY use the General Finishes brand. It really is the best! Rather than go with my usual Java color, I decided to go with the Brown Mahogany. ...you really question whether this stuff is going to work. I promise, by the third coat you will see the results you want. Then just seal it with the General Finishes wipe on top coat. After staining the top, I chalk painted and distressed the table base. I picked up a couple of oak chairs at an auction and chalked painted and distressed them as well...then recovered the seats with some leftover fabric from my club chair makeover! Perfect fit for this small space. One tip...this little table came with a leaf...while this space really isn't big enough to expand the table, it is always smart to refinish table inserts just in case want to use them in the future! Also, just a reminder that I do not seal my chalk paint with wax...I use polyacrylic. Someday this whole "distress" thing will go out of style and he will want to paint this furniture...wax would have to be stripped before he could repaint the piece! Next week I hope to share Matt's first big project...painting the brick fireplace. If you are debating whether to tackle yours, you really want to see what a little bit of paint can do...impressive! So tune in for the big reveal. As I have mentioned before, it is important to do research on "vintage" or "antique" pieces before you take a can of spray paint to them...God forbid you find LATER that you have spray painted a potentially valuable piece. With a little bit of research I found a listing for this pair on 1stdibs selling for a small fortune! The prices on 1stdibs and Chairish always seem a bit high for my tastes but I have found both sites to be excellent sources for researching vintage pieces. When I first researched this coffee table (Drexel Declaration) I found it on one of these sites for around $1600. And this little cabinet for thousands. This little chair sat out front of 410 Vintage for several weeks before I decided to tackle it. I wasn't drawn to it because of "what it is" but rather Matt needs a few little accent chairs. Since they sold it to me for $10 I didn't feel too guilty about painting it...the "true value" was pretty much toast in its current condition! The strapping on the joints (strictly decorative) is actually leather, but it was all pretty dried out and one was broken...a little hot glue fixed it right up. I repaired the broken seat strapping, primed the frame with Kilz, sanded a bit, sprayed it with black satin paint and made new cushions and pillows. I had some foam cushions stored away in my attic from an old couch and a few small pillow forms lying around so the only thing I had to buy was the paint and fabric. Since Matt is a pilot and we are leaning towards an "aviation" theme in his living room, I thought this fabric choice for the pillows was down right clever...lol! Not bad for a small investment. So now Matt has a defaced "McGuire ratan" accent chair...of little value but perfect for his needs! And cute as a bugs ear! Closing is next week and I can't wait to get started...not sure if I am more excited about Matt buying his first home or getting all this "stuff" I have accumulated out of my house! I have most of the pieces ready to load and go! I am ready to roll out the rugs, set the furniture and hang the pictures. In a few weeks I will post a few "project pieces" I have worked on for Matt's house. I can't wait to share what a few bucks and a little time and effort can do. It certainly doesn't happen often. If you have been around awhile you know I will take heirloom over just about anything. This stool was my great grandfather's drafting stool and I featured it here. It is oak and it really isn't "my style." (whatever that might be!) But because it was an heirloom piece I carefully refinished it and recovered the seat. But when it came right down to it, the little guy just wasn't very practical. First, it was kind of heavy and difficult to move around...truth is, if you lift up the seat it comes right off. Second, there is a good chance the thing was going to kill me! Since popping my cabinets up, I often need a little boost to reach the upper cabinets. The top of this stool spins and more than once I found myself dang near snapping a limb just to get to a spare can of coffee when I tried to use it as a "step stool!" It was my great grandfathers and I seriously love it...but it just wasn't functional for the kitchen! I have been on the lookout for an old "cosco" type step stool. I found several, but all were too tall...so every time I would need to open a drawer I would have to move the stool...again, not practical! I FINALLY found the perfect stool...and naturally it was a mess! Covered in paint, ripped vinyl seat, and minor rust spots on the legs. Not sure I am a huge fan of the olive green step, but the fabric has a little olive green in it so for now it will do! But the awesomest thing about this stool is it's size...perfect fit for the corner of my kitchen and perfect height for a little boost when I need it! I'm a little bummed that I had to give up my heirloom piece in the kitchen, but I will no doubt find a functional use for it somewhere, sometime! As you probably know by now, upholstery is one of my least favorite things to do. One, because it requires me to do my VERY least favorite thing...sew. Second, it hurts. Seriously after a day of pulling old fabric, staples and nails, my hands are killing me. Which is why it usually takes me weeks to complete a project. A few weeks ago I shared a club chair I reupholstered for my living room. I hardly had time to recover from that before I started on this Eastlake chair, and then it was time to tackle this camelback settee! This thing was seriously hideous. But it had really good "bones" and well, it was free! This little piece is exactly why I have vowed (time and again) to NEVER take on upholstery projects...just too much work. But how could I pass up such a neat little piece. I'm sick I tell ya! So I decided to pace myself and tackle a bit at a time. First, a day of stripping stinky old fabric and a few billion staples and nails. Then I made a few minor repairs. Then I chalk painted and distressed the little bit of wood that was showing. Then I covered the entire thing with fresh new padding and batting. Then I made the cushion covers. Then I spent 2-3 days recovering the frame. All in all, this "simple" little project took me a good week to finish. AGAIN, I could give you a blow by blow tutorial on upholstery. But AGAIN, there are a billion really good tutorials online and your best bet is to find a piece similar to the one you want recovered. Then be smart and take it to your local upholstery shop and don't complain about how much they charge you...trust me, it is worth every dime!!! Course I say this EVERY time I reupholster a piece...and next thing you know I am hauling home another battered and abused couch or chair. This strange illness I have may explain why I keep hauling home abandoned cats...who knows. I just know that occasionally I see a piece that is so different and my vision for what it COULD be is so clear, I can't help myself. I threw in a few pillows I made several years ago for my den.... it sold the day after I took it to 410 Vintage. The fact that someone will love it and use it makes all the aches and pains worth it! Fortunately, as much as I love these pieces when they are done, I have a venue to sell them. The cats...well, that's another story! A few weeks ago I questioned the need to paint an antique....seriously, is it a cardinal sin? Most "purists" would never take a paint brush to a walnut chair or mahogany dresser...I get it...I was one of them. But sometimes I have to bite the bullet and go with the flow! I bought two Eastlake chairs at an auction a few months ago. Naturally, I neglected to take good "before" pictures because, again, I am a bad blogger. The other does not have arms. It has been at 410 Vintage since I bought them. ....distressed it a tad to highlight the Eastlake detailing, applied a clear coat, reupholstered the seat and back with drop cloth and added a little graphic from The Graphic's Fairy for a touch of whimsey! The seat of the chair was in pretty good shape, but the back needed new upholstery weaving and padding. And as with most old chairs the arms needed to be glued and clamped. No biggy, but again, ALWAYS make needed repairs before investing your time and money on paint and upholstery! It sold the day I took it in. I've decided to give the other chair a makeover as well....fortunately warmer weather is just around the corner!